Now, Wizards of the Coast has printed quite a few five-color legendary creatures over the years: Karona, False God; Horde of Notions; Child of Alara; even Scion of the Ur-Dragon. Any of these would have made fine Generals for this deck, and allowed me to use any color of cards that I wanted. So why Reaper King? I can’t take credit for this combo, unfortunately; my friend Travis already has a Reaper King EDH deck built around this, and he deserves all credit for my initial idea for the deck. 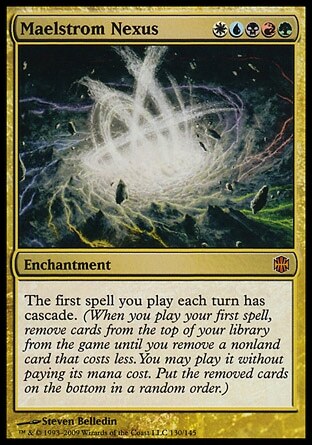 It works like this: Maelstrom Nexus transforms each of our spells (or at least, the first one each turn) into an automatic 2-for-1. Reaper King, being essentially a 10-drop we can cast for five mana, then lets us cascade into 7-, 8- and 9-drops when we cast him. 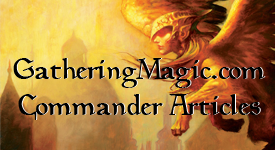 Since the deck generally runs about a turn ahead on its mana, this means that our opponents can be staring down the likes of Blazing Archon, Cruel Ultimatum or Sphinx of the Steel Wind–in addition to our general–as early as turn five. Which is pretty nifty. 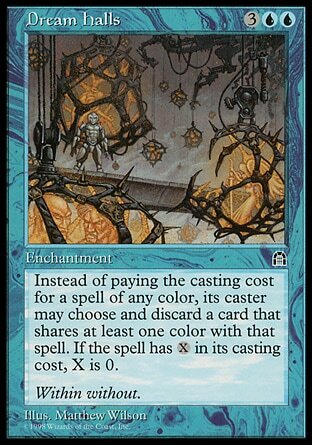 Maelstrom Nexus is just one card out of our 99, though, and even with the requisite tutoring mechanisms to get it on the table, we still have a ton of space left to make really whatever kind of deck we want in whatever colors we want. Here’s the direction I chose to go. 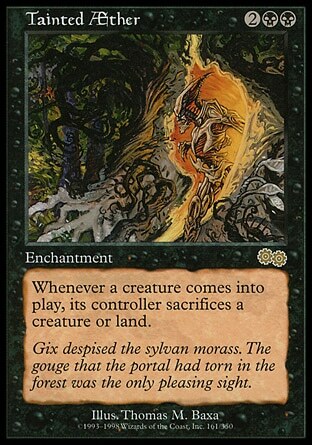 (Editor’s Note: Reminder: Nexus says the first spell you cast each turn. If you cast an instant on an opponent’s turn, you get to cascade). This is my mana base: 40 cards in total, three quarters of them land. The Shards of Alara Obelisks and “trip-lands” and the Ravnica-block “shock” duals do a lot of the leg work getting this deck up and running in all five colors, which is not a feat to be taken lightly. To anyone out there considering a five-color deck in singleton, my advice is to tackle the mana-base first. Lands are vital to color balancing, and good multi-color lands tend to be hard on the wallet (Editor’s Note: ie, Duel Lands). I don’t really have much else to say about this part of the deck, so let’s move on. This next bunch is our “control suite,” so to speak. This is what gets the deck’s engines revving and keeps us alive long enough to use them. 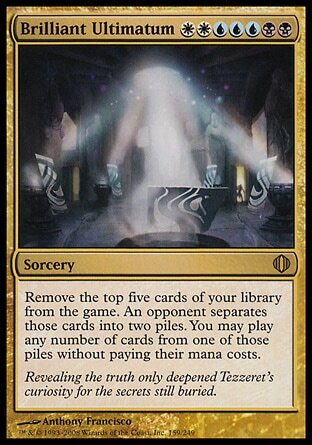 Cards of note here are Bringer of the Black Dawn and Conflux, whose sheer game-changing power if unanswered cannot be understated; and Bant Charm and Proteus Staff, which in addition to other applications are unorthodox ways to “answer” the recursive power of our opponents’ generals. Here is the real meat and potatoes of the deck – the threats and big spells we’re hoping to cascade into. Each of these cards individually does a pretty good job of threatening to ruin someone’s day, and with Maelstrom Nexus thrown into the middle, each of the rest of these cards comes as one half of a pair. Cascading into something like Dragonstorm or Brilliant Ultimatum almost guarantees us multiple relevant threats hitting the table, while the brutal one-two punch of Cruel Ultimatum into Identity Crisis lets us cripple two opponents in one fluid motion. So the deck is obviously built around the aforementioned Maelstrom Nexus/Reaper King combination. There are also other little interactions hidden in this deck that I believe deserve notice, however. Many of them can even be achieved with fewer than five colors, so if you pay attention you might see something you can use in one of your decks! Horobi, Death’s Wail – An effective bottleneck card on its own, Horobi really shines when combined with permanents that can target things repeatedly, like Ajani Vengeant and Proteus Staff. Dream Halls – The wealth of multicolor cards in this deck makes exploiting Dream Halls pretty easy, but the best thing about it is that we’re also running Progenitus. Discard any nonartifact, nonland card and we can cast our friendly Hydra Avatar for free. How cool is that? 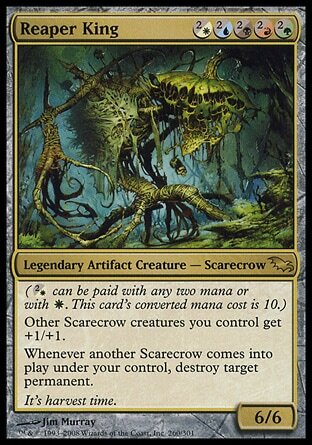 Conspiracy – Once, a long time ago, I thought about a very different build of Reaper King EDH that revolved around dropping Changelings to abuse the General’s “Scarecrow-enters-the-battlefield” ability. I’ve included a couple of the better Changelings in this deck for that synergy, but Conspiracy gives me a huge leg up by turning all of my other bomb creatures into Scarecrows. (In a pinch, it can also be cast naming “Dragon” to go nuts with Dragonstorm.) Pro tip, kids: If you’ve got a tribal themed EDH deck and you can make black mana, run Conspiracy. It lets you include any handful of random other good creature cards you want and still have them fit into your theme. Tainted Æther – Like Horobi, this card goes a long way towards bottlenecking aggressive creature decks, giving us more time to charge our lasers while they look for enchantment removal. (That’s enchantment removal they WON’T be throwing at Maelstrom Nexus, by the way.) 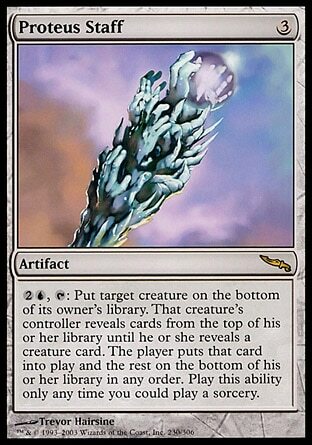 The funniest use of Tainted AEther, though, is with overpriced Angel legend Reya Dawnbringer. Anyways–that’s the deck, kids. Until next time, may you always cast 2-for-1s. If you like Jake’s Writing (and I do since I put it on here), I highly suggest to check out his blog: Competitive Casual. This entry was posted on Thursday, March 25th, 2010 at 11:15 am	and tagged with Reaper King and posted in Competitive Casual, EDH, Magic: the Gathering. You can follow any responses to this entry through the RSS 2.0 feed.